Can you believe March is over and April is upon us?! Be sure to follow us on Facebook and Instagram for loads of fun, featured results, tips, tricks and more. Warmer weather is coming (we think)! If you are concerned about stubborn fat or cellulite, now is a GREAT time to consider treatment options so that you are body confident by summer! Reach out, we would love to help! We have some awesome Botox & Dysport specials with our fabulous nurses Courtney & Taylor so be sure to check those out! Wedding season is also upon us. Please consider coming in several months before so we can help you develop the right plan for you and your goals. One of our absolute fave wedding prep treatments is Microchanneling! Learn more about that here. Thanks for visiting our website! We hope to see you very soon! Schedule a Spring Botox Refresh with Courtney Olson! Plus, redeem Brilliant Distinctions Rewards for more savings! Click here for more information about Brilliant Distinctions Rewards! Click here for more information about Botox Cosmetic! *Valid through 3/31/19. *Appointments available with Courtney Olson, RN. *Restrictions apply. Save $50 on Dysport with Taylor Hill & Courtney Olson! Save an instant $50 on Dysport when treating 2 or more areas! Click here to learn more about Dysport! Click here to learn more about Aspire Rewards! *Must be or sign up to be an Aspire Rewards Member. *Very limited Rebates available. *Must mention special when scheduling. *Valid when treating 2 or more areas. *Promotion valid with Courtney Olson, RN, or Taylor Hill, RN. *Restrictions may apply. Get longer, fuller lashes with Latisse! FDA-approved. Once daily application. Visible change within 8 weeks and full growth potential in just 16 weeks! *Must be, or sign up to be a Brilliant Distinctions Rewards Member. *Valid on 5mL size only ($179). *Restrictions apply. *Not valid with other discounts. *Limited to in-stock availability. Why is Vitamin C important for the skin? But I eat citrus and take a multi-vitamin, isn’t that enough? Less than 1% of oral vitamin c actually makes it to the skin which is why topical vitamin c in your daily skin care regimen is so important. We have several options at Radiance and would love to help you choose the right one for you! Save 20% off all featured Vitamin C Serums in April! *Restrictions apply. *Not valid with other discounts. *Limited to in-stock availability. *Expires 4/30/19. You asked, we listened! Body Laser Hair Removal Packages now available! With our new Lightsheer Desire system, treatments are fast, effective & comfortable! It’s never been a better time to break up with your razor & get laser! Save 15% off a Package of 6 Body Hair Removal Treatments! Click here to learn more about Laser Hair Removal! *Not valid with other discounts. *Restrictions apply. *Packages must be paid in full at 1st appointment to qualify for discounts. *Single treatments still available. Busy? Shop for your skincare products SECURELY on our new skincare site! 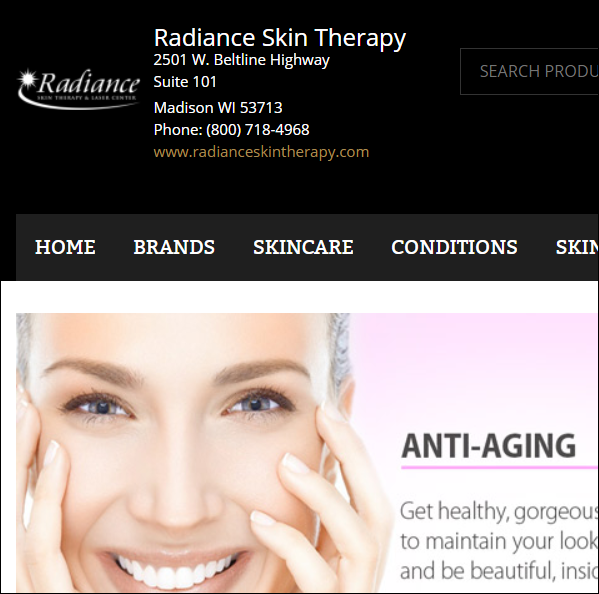 Radiance is excited to introduce our new online skincare store: Radiance’s Exponential Faces Now offering popular skincare brands such as Avene, Glytone, Neocutis, Topix, Glo-Minerals & more on our easy to use, online skincare store! You will also find some of our in-house favorites such as iS Clinical, DermaQuest & PCAskin! Use Code Radiance at checkout for free shipping on your first order! Call us at 608-240-0088 with questions or to schedule! *Some treatments may be considered off-label use. *Prices vary & often are based on the amount of product needed for individual results.